May 24, 2017: Is the ppi of a 2560x1080 34" UWS really bad? Aug 07, 2017: After lots of work and saving Im finally done with my setup. Oct 24, 2017: What is the Best Monitor Setup? 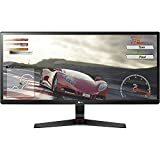 Nov 24, 2017: LG34UM69 75hz FreeSync Ultrawide - $287!!!!! Nov 27, 2017: Would an overclocked 970m handle 2560x1080 gaming? Nov 27, 2017: Is this monitor overkill/wasted on a ps4? Dec 17, 2017: Looking for advice/help on monitor mount. Jan 29, 2018: Upgrade advice on video card or monitor upgrade? Feb 25, 2018: Has anyone used the "LG 34UM69G-B" or "LG 34UM68-P"
Mar 31, 2018: 2560X1080 comparison on LG 34"
Jun 12, 2018: New user here just purchased a ultra wide monitor and need to know if it is going to work with my video card. Aug 08, 2018: Best Monitor for my 2016 15" Macbook Pro? Oct 06, 2018: Can anyone tell me the difference between these monitors? Nov 23, 2018: What's the difference between these three ultra wide LG models? Jan 08, 2019: Screen upgrade recommendations? Feb 12, 2019: Why are my games and operating system lagging on a Ryzen 7 1800x and 1050ti?